From the Home menu, click "Reports"
3. Click "Run Report" to bring up a list of bookings which match the search criteria. 4. 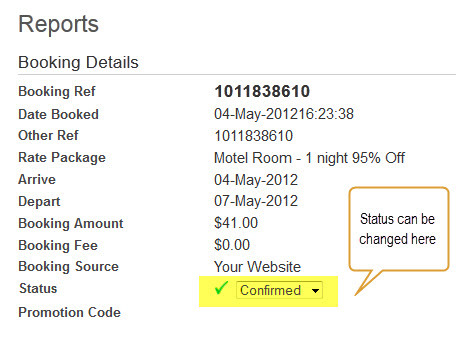 In the status column the drop down box will allow you to either confirm or cancel the booking. 5. Cancelling a booking will restore availability to that room. 6. You can also view the status of a specific booking by clicking on its booking reference number. This will bring up the following screen with additional booking details.